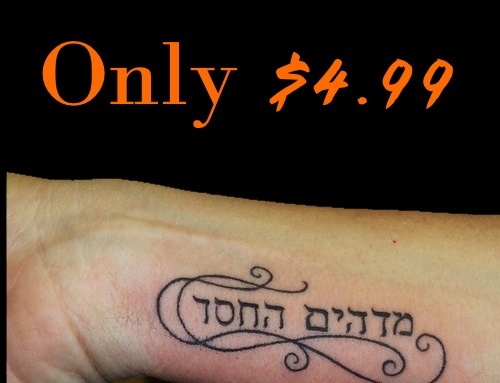 Hebrew Tattoo Translation FREE - TattooTranslate: Jesus tattoo billboard: Blasphemous or a blessing? Dozens of billboards around Lubbock, Texas, now show "Jesus" as covered in tattoos, including words such as "outcast" and "addicted." But this isn't intended to be a publicity campaign for tattoos as much as evangelizing for Christ Jesus. The website advertised on the billboards "jesustattoo.org" features a video of an actor portraying Jesus. He has a basement tattoo parlor where tattoos such as "fear," "addicted," and "useless" are magically transformed into "trust," "freedom," and "purpose." As the narrator tells us, "All of us have been marked. As time passes, life leaves its etchings on our minds, our body, even our soul. These markings come to define us, our place in society, how we perceive ourselves...."
He goes on to say that "one man proclaimed a revolutionary message of love and forgiveness ... for those labeled as outcasts and unlovable." "The message is a simple one, Jesus' love is transformative. He loves us unconditionally and no matter what you've been marked with, faith in Him and love for others will transform us," Ashleigh Sawyer, media relations coordinator for Jesus Tattoo told the Christian Post.. The video shows the negative labels moving from the tattoo parlor patrons to the body of the tattoo artist, symbolizing Jesus taking on the sins of others. The website invites viewers to accept Jesus as their personal savior and tell others. But the reaction from some older Texans, according to KEYE-TV in Austin, was less than supportive. One man interviewed called the billboards "derogatory" and another described them as "blasphemous." However, younger Texans saw the billboards as positive. "If you want to express how you feel about God, you can put that on your body," said one young woman. The generational divide about tattoos is also apparent in a 2009 Pew Research Poll of Americans. "Older Americans are far more likely to negatively view this trend: 64% of those 65 and older and 51% of those 50 to 64 say more people getting tattoos has been a change for the worse." A 2007 Pew study said that more than one third of all "Generation Next" (ages 18-25) have a tattoo. How do Christians view tattoos? Views are mixed and often generational too. Those who oppose tattoos often cite Leviticus 19:28 " Ye shall not make any cuttings in your flesh for the dead, nor print any marks upon you: I am the Lord." The website religioustattoos.net argues that Jesus the Christ came to bring grace and a "New Law" to the Old Testament laws. It also argues that the passage in Leviticus is taken out of context. Tattoos were part of pagan funeral rites and beliefs that were intended to appease the false after-life gods. Tattoos by Christians today have a higher purpose – to evangelize, the site argues. As The Christian Science Monitor reported after pop singer Justin Bieber got a tattoo of Jesus’ Hebrew name, a Christian blogger wrote: "the more serious questions to ask yourself are: What are my motives for wanting a tattoo? Am I seeking to glorify God or draw attention to myself? Will my tattoo be a source of contention for my loved ones? Will getting a tattoo cause me to disobey my parents? Will my tattoo cause someone who is weak in the faith to stumble?"